For decades we have searched for water on Mars, and we’ve found very little, either in the form of trickles on the surface or frozen as ice. But an incredible new discovery may change everything. Reported in the journal Science, researchers led by Dr Roberto Orosei from the National Institute of Astrophysics (INAF) in Rome say they have found a vast reservoir of water beneath the south pole of Mars. So vast, in fact, that it looks similar to a subglacial lake on Earth – one where life could arise. 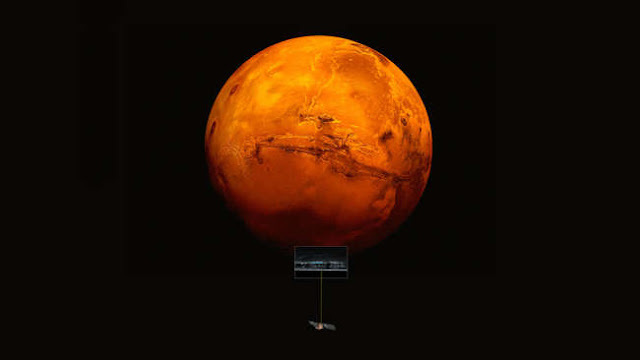 The large reservoir of water was found by a radar instrument, the Mars Advanced Radar for Subsurface and Ionosphere Sounding (MARSIS) instrument, on board ESA’s Mars Express spacecraft. The team used data collected by the spacecraft from May 2012 to December 2015. The data showed that 1.5 kilometers (0.9 miles) below the surface, in a region called Planum Australe, there was a source of liquid water spanning about 20 kilometers (12 miles) across. The team do not know how deep this reservoir of water is, but note it is at least deeper than a few tens of centimeters, and possibly more. It was detected by sending 29 sets of radar pulses under the surface, with reflections showing a radar signal almost identical to that from lakes of liquid water found beneath the ice of Antarctica and Greenland on Earth, heavily suggesting it is liquid water. However, the exact nature of the water at the moment is unclear. The team said they considered some other possibilities for the signal, including a layer of carbon dioxide ice or very low-temperature water ice. They suggest these are unlikely, however, because they would not have caused as a strong a reflection as seen in the data. The characteristics of this suspected water are complicated by the conditions it is in. On Earth, subglacial lakes reach temperatures of about -60°C (-76°F). But the intense pressure of the ice above lowers the melting point of the water, to the point where it exists as a liquid in large freshwater lakes. Under this region on Mars, however, it’s thought the temperatures drop to about -68°C (-90°F). In order for the water to remain liquid here, it is likely full of salts like magnesium, calcium, and sodium and thus briny, rather than like the freshwater lakes found under ice on Earth. We do have some briny lakes on Earth, though. A handful of subglacial lakes have been drilled into on Earth, including Lake Vostok in Antarctica. These projects are not easy and it can take years to dig below several kilometers of ice. But the scientific payoff is huge – and every time we drill down, we find life. Previously on Mars, we have found evidence for water trickling on the surface, known as recurring slope lineae (RSL). These features are short-lived, however, with the water quickly evaporating in the low-pressure environment on the Martian surface. It’s long been theorized, though, that there may be more stable bodies of liquid beneath the surface, as evidenced in this research. And if that’s the case, it provides an exciting new habitat for microorganisms of the past or present on Mars. To answer this, the team hope to use more data from Mars Express over the coming years. The spacecraft is aging, though, and it’s running out of fuel, so time is of the essence. Getting to these sources of liquid water in the future may also be difficult. Drilling operations on Earth require complicated machinery, something we simply don’t have on Mars. The upcoming European ExoMars rover in 2020 will be able to drill about 2 meters (6.6 feet) below the surface, but that may not be enough to get close to subsurface reservoirs of water like this. There are still unanswered questions about this liquid water discovery. It’s not clear if it’s a large body, or simply water seeping in between rocks. What it does suggest, though, is that liquid water exists beneath the surface of Mars. On Earth, liquid water almost always means life. Coupled with the recent discovery of the building blocks of life on Mars, and the possibility it once had a more habitable environment, evidence is building that the Red Planet may not be so dead after all.